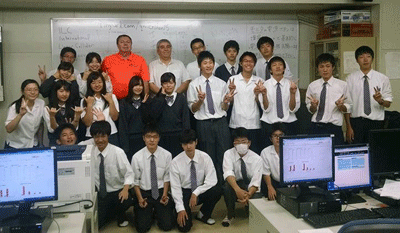 Cowley College physics instructor Martin Shaffer recently made a return trip to Japan to teach high energy physics workshops to teachers and students. Martin Shaffer is part of Fermi National Laboratories Quarknet program that specializes in educational outreach in high energy physics projects like particle accelerators and cosmic rays. Shaffer, along with Ken Cecire from the University of Notre Dame, spent two days with high school teachers at the University of Tokyo building a cosmic ray detector and learning about the proposed International Linear Collider (ILC) that will likely be located in Japan. The goal was to inform the teachers about the ILC and give them resources and lessons they can use in the classroom to promote physics career choices for their students. This was a follow-up workshop that continued from a workshop they did during the summer of 2014. Over the next two days, Shaffer and Cecire also did workshops for teachers with students at a couple of high schools, one in Tokyo and another in Shizuoka. At the high schools, they provided students with activities to help them understand the world of particle physics and further their knowledge of cosmic rays and why they are important to understand. Pictured is a group photo from the high school in Shizuoka.